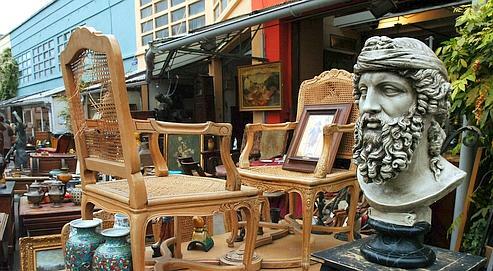 A brocante is a kind of ephemeral Paris flea market which is opened once a year in a street of Paris. Most of the dealers are Parisians living in the district but a few of them may be professionals. Treasure seekers and bargain hunters alike are invited to explore Paris street markets and Paris flea markets. As you can imagine this street is much livelier during the night but once a time, at 10am, this street was already full of parisians looking for a good occasion. if you wonder what to do this week end, then this Paris street market could be the occasion to discover the district of Pigalle and Abesses near Montmartre. When does this Paris Street Market open ? The Paris Flea Market of Saint Ouen was created in 1885 and covers more than seven hectares, and now includes fifteen markets with a unique atmosphere. Some of these fifteen flea markets (Paul Bert Flea Market, Serpette Flea Market, Biron Flea Market, Jules Valles Flea Market, Vales Lecuyer Flea Market, Dauphine Flea Market, Malik Flea Market, Malisson Flea Market, Vernaison Flea Market, Antica Flea Market) are fully covered and others are not. When the markets are not covered, you will find a multiple of open-air streets with covered boutiques for the antiques dealers. The Paris Flea Market of Saint Ouen is one of the biggest flea market in the world. Crossroads of art combining antique dealers, designers, craftsmen and artists, the Paris Flea Market of Saint Ouen is a powerful economic location. 200 000 visitors are coming every week end, looking for antiques for sale : all kind of decorative items such as vases, antiques sculptures, bowls, desk accessories, antique perfume bottles, antique mirrors, tableware, lithograph, art books, old luxury swatches like Rolex, Cartier… But most of the visitors are looking for antique furniture or antique painting. The funny anecdote about this famous market located just near Paris is that you will find a mixed communities : some of the wealthiest parisians come here to buy a painting at 10 000€ and in the meanwhile the flea market of Saint Ouen is also a popular location where teenagers of the suburbs come during their week end to buy a T-shirt, a jean or any cheap clothes.